and could take care of the family. 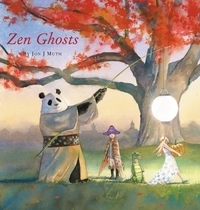 Zen Ghosts is the newest of three books by John Muth that feature Stillwater, a gentle, giant, koan-speaking Panda. All three books also feature the same three siblings - Karl, Addy and Michael. 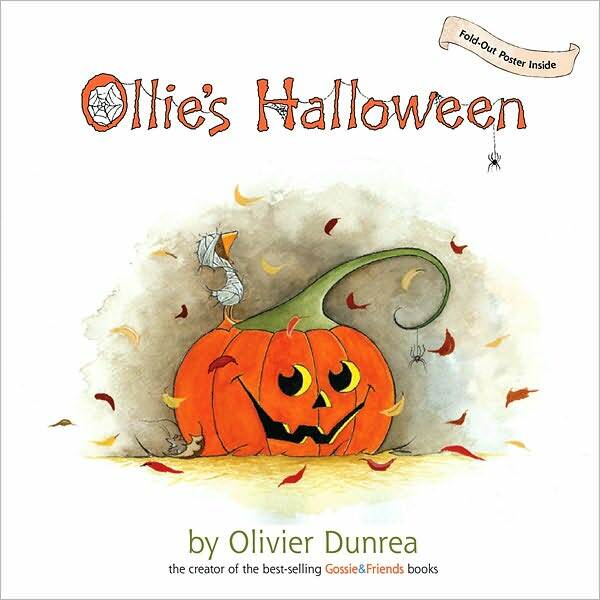 In this one, the children are preparing for Halloween celebrations when Stillwater comes for a visit. He offers to go with them and suggests a ghost story when they are done. So, they follow him to the storyteller, who clearly resembles Stillwater. The children have reason to wonder. A Japanese ghost story is told that is based on a koan from The Gateless Gate. In it a young woman escapes an arranged marriage by eloping with the man she loves, her childhood friend. Watch for the twist! The story is reminiscent of the best in folklore and offers a memorable story that teaches a quiet lesson. The magic and mystery of Halloween is not lost in this well-told ghost story. It is also simple, as Zen teachings can be. Jon Muth pays attention to all the small details while offering up good advice. Books that ask children to think about the world often lead to unexpected discussions. Jon Muth calls Senjo's story the kind that 'leaves you with more questions than answers. Stories like that can't be neatly wrapped up and placed on a quiet shelf and forgotten.' Let the talk begin! You must take the time to pore over Jon Muth's beautifully elegant illustrations. There is so much to see and to feel. The ethereal march from the brick wall to Stillwater's house, the questioning concern on Karl's face, the handpainted story-within-a-story, and Stillwater's calm presence lead to the final meditative spread where the four bask in the full light of the harvest moon. Gorgeous! poking out from the whale bones." 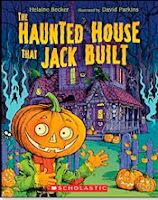 The books that I have told you about for this Halloween have been for the little ones. Next to their birthday and Christmas, Halloween holds great delight. For older kids, the appeal is the bag of candy and goodies that they can collect, and perhaps a bit of a challenge to find a costume that allows for some playacting. 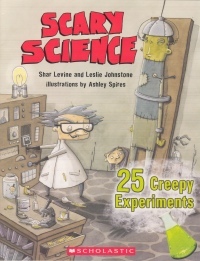 In Scary Science, readers will find twenty-five 'creepy experiments' to try in celebration of this spooky, spectacular time of year. It is written for older readers who are inspired by science and its many facets. They are warned to follow the directions exactly...even that in itself is enough to encourage attempts at some of the experiments described. Adults are encouraged to be part of the fun...supervising while also learning some basic scientific principles that they may have long forgotten, or never known. We begin with shrunken heads, using apples, carving tools and some patience to see the end result. The salty water draws water from the apple by osmosis, leaving the salt to preserve the apple. Simple, huh? And easily explained. Each experiment is detailed with needed items, the method and the explanation for what happened. A 'strange...but true' box gives additional information for most pages. The table of contents entices with such titles as 'alien barf bag', 'exploding stomach', 'ghost legs', 'spooky writing'. The glossary offers simple definitions for unfamiliar language. The cartoon illustrations add just the right touch, especially the front cover. Now, there's an invitation to come inside and see what's cooking! Great fun for all, and another way to celebrate this spooktacular time of year! watch it grin or grimace or wink." I really like this book, and have been holding onto it for months. I wanted to share it with you today. Now, you can order it for next year, if you think it sounds like a book you should have! 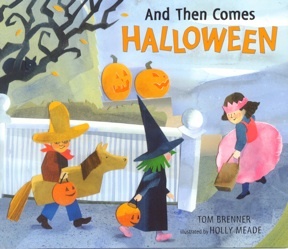 Tom Brenner makes exceptional word choices to give his readers a sharp picture of this favored day of the year for young children. Holly Mead provides all the appeal of a Halloween celebration made at home. Children create and hang the decorations, carve pumpkins, and design simple, recognizable costumes to wear as they hit the streets to trick or treat in their neighborhood. They are together and they are having the best time! All senses get in on the action....listeners will request an immediate reread. What could be more fun? As the night comes to an end and the children prepare for a much-needed rest, they cannot help but dream of next year and the fun that is in store for them. A whole year to decide who to be, when autumn returns and brings another Halloween with it. Awesome! "Splat's mom caught the spider under a glass jar. so scary now that it was trapped. "Can I take the spider to school for Halloween?" Splat does not exhibit typical tendencies for a black cat at Halloween. We are supposed to be scared of them, right? He doesn't like spiders and he doesn't mind letting 'the cat out of the bag' about it. When his mother captures one, Splat is much calmer and oh, so brave. He wants to take it to the school celebration. He also wants to be the scariest cat at the party. He is determined, until he meets his friends on their way to school. They are unimpressed; and in turn, Spike and Plank almost scare Splat out of his paper-filled sock spider legs. He is crestfallen and now sure that he won't win the prize he so badly wants. The friends continue on their way. Upon arrival, they show the jack-o-lanterns they have carved. Splat's has no scare in it, just laughs. 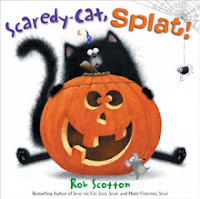 The teacher's ghost story is just right for scaring everyone out of their seats...Splat is an accident waiting to happen. When his lighted lantern lands on his head, Splat serves up scary sounds and actions that win him the coveted prize. Ah, sweet success! You may be familiar with Gossie and Gertie. If not, you should meet them. For Halloween the two little goslings have donned simple costumes and are ready for the big night out. Gossie is a wizard, needing only a pointy, starry hat, a star necklace and red boots. Gertie is a chicken with blue boots, leaves for tail feathers and a red rubber glove atop her head. Their friends, Peedie, BooBoo and Ollie are with them so as not to miss all the fun! Ollie is a tiny, adorable mummy. None looks particularly excited to be out on this scary, bewarey night. However, they are 'on the prowl'. They do all those things that make Halloween so special for little ones. They hoot and howl, creep and scare. Ollie is always a little bit behind...and alone. Olivier Dunrea is so adept at creating characters who exhibit the concerns of his intended audience. His watercolor art is detailed, expressive and affords readers a chance to observe the goings-on of the group. The simple text perfectly complements the art and creates yet another chapter in the Gertie and Gossie lifelong adventure. Fun! That cooled in the house that Jack built." Kids love cumulative stories and we know that repetitive language helps them learn to read. Once they have tuned in to the pattern of the text, it isn't long until they are reading it on their own...and isn't that we want for them? In this addition to a host of Halloween titles, we come face to face with a smiling 'Jack' o' Lantern who is putting up the last of the holiday lights and offering a warm welcome to his spooky home. 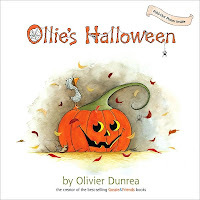 With each turned page, readers are regaled with familiar Halloween images and a additional line of text. The language is well-chosen and the expressive art will have excited readers moving quickly from one episode to the next...a ghost, a ghoul, a mummy, a beast...the list goes on and so does the action. It ends with a monster popping corn, and a wish to share with all who were invited to the costume party. What fun to watch as they peel back their 'other' selves and join in the fun with their friends! That was held in the house that Jack built!" Bring on the crusher blade. "You're on Mount Trash-0-rama, baby." And he's right on the money. Throughout the night, this unglamorous guy roams the streets picking up the trash that people create. He takes it in, grinds it up and finally spits it onto a barge that will take it away! Then, he heads for home (the garage) to get cleaned up and start all over again tomorrow. As he travels we can almost hear the throttle, the hopper, the compactor smashing and crushing each new load. After a huge BURP! he has room for an 'alphabet soup' of trash. It begins with 'Apple cores, Banana peels, Candy wrappers and Dirty Diapers and ends with 'zipped-up ziti with zucchini.' I'm sure you can see the possibilities for classroom writing, and imagination. There must be other workers, and work machines that would offer up ideas for future stories. The illustrations are filled with bold colors, neverending action and many opportunities for drama and interpretation as you explore the story with young readers. While enjoying the telling they are also learning about a community helper that is often forgotten. What fun! but I need some Zzzzzzzzzzzzzzzzzzs." "City Dog and Country Frog played together. jumping and splashing and croaking." My friend Jan MADE me buy this book. Well, not really. But, when I was visiting her store lately, she asked if I had read it and when I said I had not, she said she thought it might be her favorite picture book ever...of all time (at least, at this moment in time). That is pretty high praise and was certainly all the incentive I needed to put it on my pile. I am certainly happy that I did! 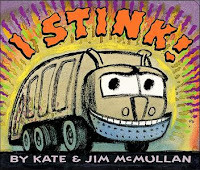 It is not like a Mo Willems book; at least, it is nothing like the books that I have in my library by said author. I love the Pigeon, the Naked Mole Rats, Knuffle Bunny and Trixie and I REALLY love Gerald and Piggie! This, I was not expecting. It is the first book where he has not done his own illustrations. If you know his work, that won't be too surprising because this one is definitely a departure from his urban, irreverant and hilarious characters. It's spring and City Dog finds himself living in the county. While freely exploring his new digs, he comes face to face with a frog. Country Frog has been waiting for a friend and he guesses that City Dog will do. 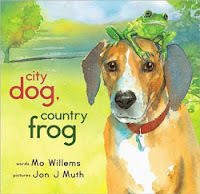 All through the spring Country Frog teaches City Dog new games. In the summer City Dog returns the favor. As summer turns to fall, City Dog races back to the rock that is Country Frog's home and finds him tired and ready only to play remembering games. When he returns in winter, he cannot find his friend anywhere. But strong feelings of friendship linger and City Dog, patient and heartbroken, awaits his friend's appearance. When spring returns with no sign of Country Frog, City Dog is sad and shares that feeling with an inquisitive chipmunk. Country Frog has taught him perhaps the best lesson of all...being a friend. With a winsome, froggy smile, City Dog moves on to new adventures. Jon Muth's watercolor artwork gives us memorable characters in an idyllic setting whose love and admiration for each other is strong and true. I love the wagging tail, the panting tongue, the soft and gentle touches and the final froggy smile! His beautiful bold colors place us firmly in each of the seasons. How better to show the deep feelings than with the cover iluustration, which is shared above. BRAVO! Knuffle Bunny on the plane. But the plane had left for CHINA. China is very far away...."
I often rail about trilogies...it seems we are overrun with them. Of course, I have no intention of criticizing ALL three part series...only some of them. I just get a bit tired of seeing the cover of a new book and then seeing that it is the first, or second, or even the third book in a new TRILOGY! Now, I don't mean Hunger Games, or Dark Materials and for sure, I don't mean Knuffle Bunny. In fact, this third book about Trixie and her favored stuffed toy is the 'just right' ending for their adventures. After all, Trixie is growing up! Most of us have been where Trixie and her parents find themselves. Well, not in their neighborhood but certainly in a similar situation. Think back (for those of you with grown children) and try to remember a time when a favorite blanket, toy, soother, whatever, got lost, left behind, hidden...remember the trauma? There was no soothing the child, until the lost was found, or they cried themselves to sleep. That is how Trixie felt about Knuffle Bunny in the first two books. And it looks like it might be the same again; when he is left behind on the plane that has taken the family to visit Trixie's grandparents in Holland. The beginning of the holiday is stark for a young girl who is very much missing Knuffle. He has always been her best friend, her solace, her port in any storm. She misses him, and she worries that she will never see him again. Imagine her surprise when, on the flight home, she just happens to find him in the airline pocket with the safety card and in flight magazine. She is over the moon! When she hears the baby behind her fussing, she wonders out loud if he would like to have her Knuffle Bunny. Her parents are amazed and cautious, the baby's mother is incredulous and thankful and Trixie is growing up and willing to share the joy of having a best friend. She is ready to part with him. Back home and settled Trixie soon receives her first letter in the mail...she is thrilled. She now has a pen pal. Her Daddy has a wish for her future and he shares it with us. It is the perfect ending to an amazing trilogy! 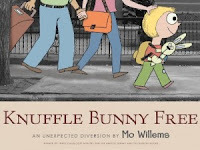 As in the first two books Mo Willems creates his illustrations using black-and-white photography paired with ink drawings and digital collage. It's so much fun to carefully pore over each one, noticing all there is in the background scenery and the expressions of each character. So long, Knuffle Bunny. I will miss you, too! If you haven't seen Once I Ate A Pie (Harper, 2006), you missed a real treat! Don't make the same mistake with this charming, and most enjoyable book. It is a perfect companion to the first, and you won't be sorry if you add both to your poetry collection. I know you don't have to love dogs to appreciate it, but I am guessing that dog lovers will find it especially pleasing. Each of the poems is voiced by the dog pictured and run the gamut from confession to plea. Each of the dedications come from the heart, and introduce a true collaboration of wonderful words and beautiful art. The first illustration shows a pile of brand new pups, docile and dozing together as they begin life in a closet. The voice softly pleads for peace and quiet. The next gaffer is miserable and nameless, but determined that no cutesy name will do...he wants to be called Big Bad Bob! And so it goes. Every night you pat my head. 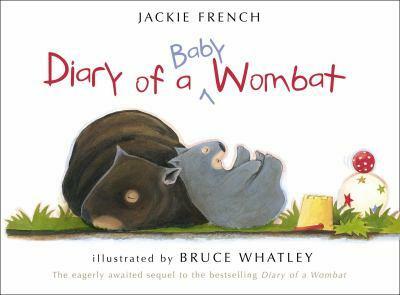 If you remember and enjoyed Wombat's first diary...you will be very happy to meet Mothball's baby. She has obviously mentored him to be as rambunctious as she was...and more! He loves to sleep, but is quickly bored with that sedentary life. Poor Mum wants nothing more than to rest and relax. It's a tough sell for a curious, climbing joey. He likes to do all those things that his mother did before him and in his travels, he comes face to face with someone who smells vaguely familiar and even has some of the same characteristics...a baby! They play together and then both fall exhausted into slumber...only to get up the next morning and do it all over again. Now, naptime brings another young charge for Mothball to comfort. As her baby grows and gains momentum, their home hole seems to be getting smaller and Mum decides they need a BIGGER one. Off he goes to accommodate her request. A new hole is dug. With three inhabitants, it is still too small. The hunt is on for another, bigger, more comfortable place. Of course, the search is hampered by the many distractions that life brings and the fun that two youngsters can generate. Baby finds a GIANT hole and is anxious to tell his Mum about it. When they return, they find it gone (that is, the door is closed). So, the digging begins in earnest. All done, settled and happy, it is time to look back at the week that has passed and 'read it again'. Bruce Whatley is the perfect artist for Jackie French's spare and droll humor. His roly-poly hero gets into much mischief and mayhem, without the slightest hint being given in the text for what transpires. And yet, her words conjure up such funny images for him and thankfully, for us. The equally roly-poly human is the perfect playmate. A lot can happen for these two in one short week! he'll be digging in the dirt. only bubbles, head to toes." Imagine the delight and the guffaws as Piggy Pie Po struts off to bathe the dirt away in a relaxing, bubble-filled tub! 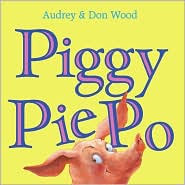 I have always loved and shared the glorious work of Don and Audrey Wood. Their books have long been favorites of my children when they were young, of my school kids when I was reading picture books daily and perhaps someday, my grandchildren! I just put a new issue of The Napping House in a pile that might someday belong to them. It will certainly be enjoyed and loved by someone. So, I am happy to tell you about their new book. It is a special occasion when we can celebrate another one from this team. This adventure will be quickly picked as a favorite by the young, who will chant along with the rhyming couplets in no time at all. It is told in three short chapters and introduces us to the guy who is 'the show'! He's big, boisterous and brawny! And, we like him. He wears a huge and happy smile (well, most of the time) and is willing to try almost anything. In the first chapter, he is off on one fascinating foray after another...to a party, to swim in the sea, to sail on the ocean, to work until he is filthy and needs to clean himself up. In the second, he shows how smart he is and the many things that he can do independently. In the final chapter, he finds his real passion...food! There is nothing that he will not try...and it turns out to be his downfall. Kids will love the surprise at the end, and are likely to beg for a second helping. Predictable rhyme, full-colored and appealing artwork done by this husband-wife team bring Piggy to life as he prances happily through his days. He is talented, inquisitive, active and at times worthy of our sympathy. You know you are going to love him!
" The United States launched the largest air and sea search in naval history but found nothing. Mysteries abound. In 1940, a navigational tool called a sextant and a human skeleton were found on an uninhabited island (today's Nikumaroro). More recently, other artifacts have been found on the island, including an aluminum panel, a piece of clear Plexiglass (the thickness and curvature of an Electra window) and a woman's size 9 heel dating back to the 1930s. There are those who believe that, like Star Dust, Earhart's plane was swept away by natural forces. Perhaps it was carried off the island reef by ocean tides to where it now lies waiting to be recovered." Some mysteries are never solved, and some are closer to a solution now than ever before in history. Much has changed since 1457 BCE when Egypt's first female pharaoh disappeared. Now DNA can help to solve long-ago mysterious happenings. Scientists have been and continue to use new technologies and forensic evidence to try to solve cases that have been unsolved over long years, and even centuries. 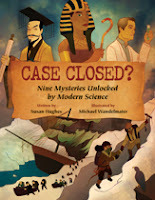 It is, in fact, DNA that closes the case for Hatshepsut. There are entries here about the Franklin Expedition, the Arabian city of Ubar, and six other mysteries from both ancient and modern times. In each case, modern science is providing some help in trying to bring solution by focusing on the people, the transportation and even other civilizations. There are maps, photos, diagrams and artwork to help the reader understand the evidence as it is known today. Some of the cases have been solved, while others offer new findings that might help the reader decide if the given results are satisfactory. A world map provides the 'where' for each case. An introduction in each section provides the most up-to-date information. Then, the mystery is plotted in point form and background information shared. An explanation about the methods, assumptions and data gathered follows and finally, a decision is made about the case itself...closed? or still open to interpretation and further research? We read the files, meet the investigators and learn about the search methods and tools used in each separate case. In a very infiormative and compelling book, the author has provided much food for thought, a clear explanation for the research and analysis being used to make new discoveries, and an invitation to delve further into the mysteries presented. A glossary and index follow. "I had to admit that we'd really had a good time together. When I thought about it, it reminded me of how I used to feel sometimes playing with Ruthie. And then I thought that I hardly ever felt that way with Martha. Maybe it was because Martha almost always decided what we were going to do. And some of my favorite things, like paper dolls and hopscotch, we hardly ever did because Claire said they were babyish. But I still liked Martha better than Mimi." When Allie's Dad can't find work and the family must move to a new home, her imagination runs wild when she learns that they are going to move to Strawberry Hill. She is aware that she will miss her best friend, her school and the life she has known until now; but, she is so excited at the thought of all the strawberries that await her at her new house. This is her first disappointment. When they get there, no strawberries are evident and there is no real hill. We have all been there. Mary Ann Hoberman creates a lovely piece of historical fiction that gives authenticity to the wide range of feelings and experiences that Allie has in her first year in Stamford. The characters are so authentic, honest and vulnerable. In a short interview with the author, she said that her first novel began as a bit of memoir. She wanted to share her early life with her readers and to think back on it herself. She writes with style, sensitivity and substance. Allie faces the normal bumps on the road as a fourth-grade girl in a new community, at a new school and navigating all that this 'newness' entails. Friendships with two neighbors are the focus as she settles in to her house and her new life. The girls are as different as day and night and Allie struggles to sort out the feelings that she has for each of them. She meets Martha first, and is enamored of her life and her presence. Martha is Catholic and goes to a parochial school. Mimi is Jewish (as is Allie) and they will attend school together in the fall. Martha and Allie spend time together happily, until Cynthia returns from her vacation. Jealousy rears its ugly head, and things go off course in a number of ways. Despite some troubles, Allie is convinced that Martha is best friend material. Mimi, on the other hand, lives in a house that leaves something to be desired with a mother who is less than appealing. Her father has gone, and the two are left to fend for themselves most of the time. Add to that the fact that Mimi is overweight and not a good student. She is staying behind in third grade to improve her reading skills. Mimi is also sensitive, interesting and anxious to spend as much time as possible with Allie and her little brother. The two relationships have some unexpected twists, as is so typical of friendship at their age. The story, with its many little vignettes, gives an honest look at some of the difficulties of life at this place in history, but they do not overshadow the story being told. The hobo, the homemade cookies, the piggy bank that yields $1.16 to almost buy a book for a friend, and fathers seeking employment are short, sharp glimpses at life being lived during the Depression. You know that you are in the hands of a seasoned storyteller as you enjoy this wonderfully wrought novel. The balance that she creates between Allie and the many others who people this story allows her readers to fully realize some of the struggles and accomplishments that happen during the first year spent on Strawberry Hill. Nostalgically it takes me back to a simpler time, when despite a lack of finances and a glut of material things, we took great pleasure in neighborhood friendships and activities...and reminds me that friendships were not always easy, but they were worth the work. Allie helps us to understand that. The final scene provides the small, but significant surprise that is the perfect touch to end this appealing and much appreciated book. 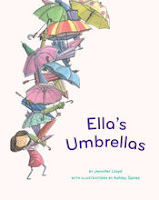 "Ella had big umbrellas and small umbrellas. She had umbrellas in pink, turquoise and tangerine. Several were striped and a few speckled with spots. A sprinkling had sparkles. A handful had hearts. Some opened slowly and plenty went POP!" While I was reading this book, I made a connection to The Umbrella Party (Groundwood, 1998). So, I hustled downstairs and took it off the shelf to read it again. I still love it! Ella loves umbrellas and eveybody knows it. No matter the occasion, the gift of choice is another umbrella and now, she has too many. She has a favorite. It is robin's egg blue and came from her Aunt Stella who lives far, far away. Stella is on her way for a visit and she is going to stay in Ella's room. What excitement for the young girl! Ella's mother is not her calm and contented self today, and Ella tries to help. She moves her umbrellas from an old spot to a new one, but her mom still complains about them. They are everywhere! She suggests that Ella make gifts of her many umbrellas. And, she means business. Ella piles them on the front lawn, with a tiny sign offering free umbrellas. The postman arrives with postcard in hand and doesn't seem to notice the sign. Imagine! Her mom comes out to mow the lawn, sees the sign and suggests that Ella find a better way of ridding herself of the many umbrellas. A bigger sign, a wagon ride and a rainstorm brings a solution. As people rush past, she offers them relief from the storm. Almost home, she only has her very favorite one in hand. Along comes the postman, drenched and grumpy. Ella knows what she must do. Guess what? Aunt Stella is waiting when she finally gets back, and she has a gift for Ella! 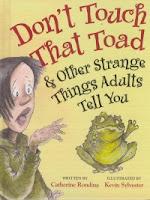 Kids will love the warmth and humor that this predictable story evokes. The softly-drawn artwork adds to those feelings, and give context to the problem that must be solved to her mother's satisfaction. "What many people appreciate about dogs is that dogs love and accept them no matter what. Since canines can't speak, they never dish out advice, judgement, or criticism. They listen, but they don't tell your secrets. Studies show that dogs can change their owners' lives by making them happier, lowering their blood pressure, and helping them make friends by meeting other dogs and their owners. Talk about a best friend!" "Animals have led our ancient ancestors to explore the world, trampled and chowed down whole fields, creating deserts in their wake, killed millions of people as "secret agents" of disease, and even separated the rich from the poor." If that doesn't pique your interest, I am not sure what might. She begins with the goat and regales her readers with a host of facts about the goat's development over the ages. She refutes a commonly held belief that goats will eat anything, including tin cans, clothing and garbage. In fact, they are quite picky but their need to eat plants from top to bottom meant that they often killed the plants and and perhaps helped to make the Saharan expanse larger because of their destructive eating habits. HUH? She moves on to sheep and cattle. An opening paragraph gives a small bit of information from history and then invites us forward to make a number of discoveries. The 'mug shot' offers names given, the date they were thought to be domesticated, how many exist in the world today, those that live in the wild, and their claim to fame. Clear color photos, charts, cartoon illustrations and information boxed fill the pages and encourage readers to keep moving on to the next section. 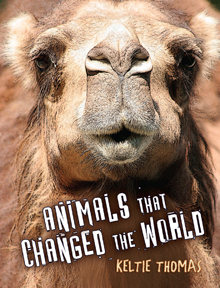 There are seven chapters; they tell about animals from ancient times to the present, from pets to work animals, from agents of disease to those that spark inspiration. Keltie Thomas also provides a world map at the beginning (although I was not able to connect the colored dots to any other part of the book), suggestions for more reading and a sharing of the sources used for this book. She works out an 'animal footprints in time' timeline to help us understand their development throughout history. She ends with an index that encourages readers to go back to a favorite part. "Pigeon droppings land everywhere. One pigeon alone poops 12 kilograms (26 pounds) of excrement a year. Good thing pigeon poop makes excellent fertilizer." Now, if we could get those pesky pigeons to aim for our gardens, not our cars and sidewalks! "Idiom: a group of words whose meaning cannot be understood from the meaning of the individual words; an expression, peculiar to a specific language, that cannot be translated literally." "As judge of the Tiny Tot Talent Contest, Leon had to face the music." Picture it: The audience is in its place. The chipmunk is atop a three-legged stool with a huge horn to its mouth. Leon the lion is facing the chipmunk and horn, mane blown back as if in the midst of a windstorm. Kids will realize this is quite the unusual situation given the common relationship between a lion and a much smaller animal. Before the book comes to a close, Wallace Edwards explains that face the music means: 'to accept the consequences of your actions; to receive punishment.' Yep, I would think Leon knows that feeling! What fun it is to share another book by this talented and award-winning artist! It is a worthy companion to Monkey Business (Kids Can, 2004). Once again, there is so much to see in each of the rich and dramatic drawings. Kids will spend long stretches poring over all that is included for them to see. I could go through the book one adage after the other; suffice it to say that this is a worthy addition to any collection and will give interested linguists a literal view of a unique element of the English language. The illustration brings meaning to the saying, as well as giving us a clear look at the character in question, the environment and how that character is feeling at the moment. 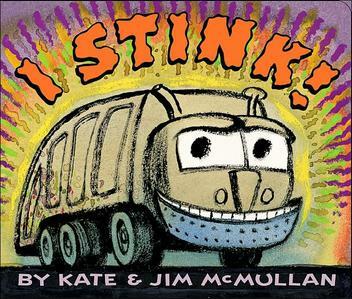 Kids in intermediate grades might use it as a mentor text for choosing idioms and illustrating them, for creating their own scenarios and for expanding their own language. The glossary provided, following the text, explains the idioms presented and will leave readers with a clearer understanding. 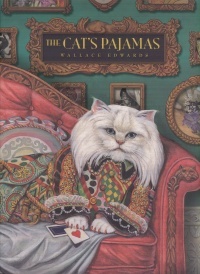 As well as that, Wallace Edwards leaves us with a task that will send us right back to the first page...can you find the cat on each and every page? It is the perfect invitation to go back and look even more closely at the exquisite details. Another triumph for this fine artist! jumping. Not this moose. Too wet. kite flying. Not this moose. Too windy. skiing. Not this moose. Too cold." What's a moose to do when he doesn't like to indulge in the many activities that his friends seem to enjoy? As he watches them in each other's company doing the many things they love to do, he occasionally wonders if he is missing something. He tries hard to find the answer to his own question, but cannot. One day, he just makes the decision to get out there and 'take life by the antlers'. That is the only way to change his life. As he comes to that momentous decision, he notices a sailboat, unmanned and sails flapping. It is all the incentive needed. Off he goes, straight into a full-blown storm! 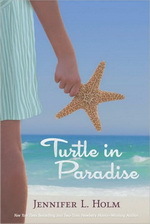 He washes up on a deserted island, sharks scouring the surrounding sea and boat broken and beached. At any other time, he might have given up. But, decision made to make something of his life, he takes control and learns what he needs to know to survive. He finds fresh water, makes a fire, builds a shelter, discovers a food source and meets a new friend. He and Tuesday become inseparable...making the best of the lot they are dealt. Life is good! When a ship appears, Moose must make the difficult decision to return home, leaving Tuesday behind. They make plans to keep in contact and to meet again. We know his life will never be the same! This is a great readaloud! Told in simple language with appealing cartoon-like illustrations, listeners will enjoy the lesson learned about finding your place in the world and living life with gusto! soft blue eyes, and all she sees is kittens and roses. they are. The mean boy on the porch has green eyes. Probably from all the snot in his nose." Thus, Turtle meets Beans, her cousin in Key West, Florida. He is a cousin that she knew nothing about until her world is turned upside down and she has to leave her mama and go to live with her mama's sister and her family. It is 1935, the height of the depression. Turtle's Mom does housework and generally lives with the people for whom she works. Her new job with Mrs. Budnick is a good one, but her employer does not like kids. So, Turtle is shipped off. Meeting her cousins, their parents and the others who make up their community has its trials, but it also has its treasures. Key West is a poor community and most of its people get help from the government just to put food on the table. The Diaper Gang is a group of boys who 'work for candy' to help the mothers by taking care of their babies while they work, or run errands. They seem to have a gift for soothing the babies and they certainly have a secret cure for diaper rash. Turtle tags along, watching them and learning as she goes. She misses her mother something awful, but knows she is where she is until her mother sends for her. Everyone here has a nickname. Luckily, Turtle's fits. As her mother grew up here, everyone knows who she is. She meets a number of interesting people on the daily rounds. She is welcomed and finds acceptance among her cousins and the neighbors. One of the people who comes to love her is her grandmother; a grandmother she thought was dead (that is what her mama told her). Nana Philly has a reputation for hating kids, but she seems to enjoy her feisty, independent and thoughtful granddaughter. "The tears rain down like spitballs, and there's no stopping them now. They're like a hurricane sweeping me away. Mama's drowning and she's dragging me under with her, and this time there's no one to rescue me. This time I'm not going to make it -"
Hallelujah! There is family...and they gather round, take Turtle and her mama under their wings and offer the stability and peace they need to move forward once again. This character-driven story offers up a fast pace, lots of action, an inspired setting and poignant family scenes. I've read it described this way: 'you're gonna find yourself up to your ears in scorpions and smugglers, boys and baby powder, treasure and trouble...as Turtle comes to learn what home is...' and that is pretty apt! The story comes from Jennifer Holm's family history and her knowledge of the Conchs and the Key West community. She tells it with love and pizazz. She leaves us to hope that we will meet up with these characters again, in the near future. "Giant African millipedes coil up to defend themselves and emit a strong-smelling, foul-tasting fluid through a pair of tiny pores on the sides of each body segment. They only discharge the chemicals from those segments when they are threatened. The defensive secretions of this millipede are relatively mild. The longest known individual of this species was a captive specimen owned by Jim Klinger of Texas, US., which had a body length of 15 1/8 inches (387 mm) and a circumference of 2 1/2 in (67 mm). This is the world's longest bug." "When I was two I found a rolled up giant African millipede (the world's longest bug) and, mistaking it for a biscuit, I bit it. My mouth and face were covered with the foul smelling fluid this species produces to protect itself. My mother says she couldn't get the smell off me for days, and it made me dislike millipedes for very many years." Ya think! Just looking at it (in real size) makes me a little queasy! The description in the book of this 'longest' bug, includes a world map highlighted with the area where the bug is found...Somalia, Kenya, Tanzania, Zanzibar, Mozambique and northeast South Africa. There is no mention of Manitoba and chances of a trip to Africa in my future are slim to none. So, I guess I can look carefully and without fear at the clear photographs also captioned on this double-page entry. There is a photo, as well, of the savannah and three paragraphs of clear, informative text to give readers the pertinent details. Each entry follows the same format and will intrigue and entertain budding entomologists and anyone else who just loves to add such information to their store of knowledge. The names are full of descriptive detail. Consider the Giant Leaf Bush-Cricket, Rhinoceros Cockroach, Saint Helena Giant Earwig, Titan Longhorn Beetle and finally, the Giant Tarantula Hawk Wasp. Yep, they are all there in full size glory! I checked each map closely and found only one on the North American continent, a few in Central America and so, for now, we can rest easy! "I spent every weekend for almost four months writing Big Bugs Life-size, just managing to make my deadline. The next six months were spent working on the design and layout of the book with the Museum's Publishing Department. The process took a long time because the photographs we needed were very difficult to locate." Find them they did and they make for a fine piece of nonfiction. In the further information section, the author fully references the details about these record-breaking bugs. An index allows readers to search location, scientific name, type of insect, known name, and noted accomplishment such as heaviest, biggest, longest. While I can't say that I like bugs more than I did when I started reading, I certainly know much more now that I did then. They are almost gone for this year...as the weather cools and the nights get downright cold, few bugs want to hang around in hopes that there is still warm weather on the horizon. I don't blame them and I welcome their departure. No more sticky webs to sweep off windows, and flies to swat inside the house. Wait...it sounds like I don't love bugs. (I don't!) But, that doesn't matter to the little one pictured here. He loves ALL bugs and he doesn't mind describing them for us. From big and small to hairy and scary...he is intrigued by each and every one of them. And so we go exploring with him. With bright colors and oversized depictions, we enter his world of wonder and gaze in amazement at the variety of bugs in his neighborhood. Each has its own special allure and he is content to watch and enjoy them under logs, in hives, at picnics, in the daytime and at night.
" 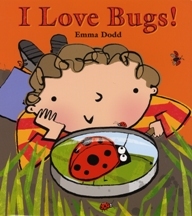 I love flouncy frilly flutter bugs and silly clitter-clutter bugs." Who wouldn't delight in that language? The collage illustrations are filled with bold outlines, changing perspectives, bright backgrounds and many details for young readers to pore over. Soon, they will naming the many bugs they recognize. It might even inspire a bug hunt of your own. Go for it! The surprise ending is perfect! "There are over 30 000 different types of orchids in the world. This orchid is named for its petals, which look like moth wings. When a moth orchid blooms, its flowers will last for several weeks at a time. Orchids love shady, warm and humid places. This is why they thrive in many of the world's rain forests. These colorful plants can grow on rocks, creep over the ground and even climb up trees." I have written about this exemplary series before, and continue to be impressed by the quality of the design, the accessible text and the gorgeous photography. They provide journeys to places that young readers will have access to, and some that they will not. From the first page they are drawn into the guessing game. A round 'eyeglass' shows a close-up photo of something that is described in a series of questions. The questions may elicit a myriad of other guesses, before turning the page to reveal a hibiscus. Kids are naturally curious and they love these types of books that have them looking closely to try to determine the right answer before the page is turned. Because the text is repetitive, it won't be long until they are reading it on their own. While the language of the guesses made is more sophisticated, you can hear them making up their own questions related to what they are seeing through the looking glass. Sounds like a class book in the making to me. Once the guessing is done, we flip the page to find the focus of the camera lens. The informative paragraph displayed to the left of the three-quarter spread image provides just enough text to garner interest and to add to the child's current store of knowledge about this habitat. The final full page spread shows the wonder of the rain forest vegetation, suggesting its unique ability to sustain its many inhabitants. 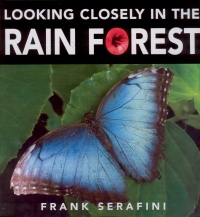 It is Frank Serafini's belief that we must look closely at nature to make us more aware of its beauty and to encourage us to take an active role in protecting what we have. His beautiful photos speak to the love he has for his subject and seem almost magical. I can only imagine the patience and time needed to get that 'just right' image to share with us. "Don't be a drip, Mom - it's not true. When it comes to avoiding a cold, it's more important to wash your hands than it is to dry your wet hair. A cold is actually a virus, and viruses don't care if your hair is wet or dry, or it's hot or cold outside. You can catch a cold only from direct contact with someone who already has one. Doctors believe that colds are more common in the winter not because of the temperature, but because we tend to stay inside for longer periods of time, where germs breed all around us." This was an argument my Mom and I had until the day she died; and we laughed about it all the time. I often didn't take the time to dry my hair before heading off to do whatever I needed to do that day. If Mom saw me with wet hair, she shook her finger and told me I was going to get sick....and I was sixty years old! She had a number of other 'old mother tales' in her repertoire and some of them are included here. The title sure got my attention and I know it will do the same for its intended audience. We all want written proof that what our parents have been telling us over and over again is not likely 'the real deal'. "Animals can predict natural disasters. During the horrible tsunami that struck Southeast Asia on December 26, 2004, more than two hundred thousand people died, but many animals survived. Although it's not scientifically proven, many people believe that the animals had some sort of early warning that the storm was coming." What do you think? What have you noticed about animals and weather? I like the writing style. It offers up the 'strange thing' and then provides quick, positive comments about it. The accompanying pen-and-ink drawings keep the tone light and humorous. If you are thinking about a gift for the inquisitive child, this might be just the ticket. How many of these have you heard, and what memories do they evoke? "Always wear clean underwear, in case you get in an accident. When I was your age, I had to walk 10 miles through the snow to get to school." " A flying wonder flutters near. "Mothdogs! Get yer mothdogs here!" "Perhaps you'd like some Cricket Jack?" watch the grounds crew lay the bases." Ah, the World Series starts tomorrow and I am ready for it! Sorry that the Blue Jays didn't make the playoffs, but they had a great season...tough to beat the teams in our division. So, now I will have to find a new favorite team to root for....I wonder if there will be bats watching? If you look carefully at the cover page above, you can see them rooting from the stands and the roof. Ah, the benefits of being a bat. Of course it's a night game. The setup is a circus tent, with fans and food galore. The flag is flown in, the umpires stand ready, the anthem is sung while the band plays and it is game on! The action is intense, the cheering wild and the seventh-inning stretch brings a measure of calm. The rest of the game is filled with thrills and great excitement. So much to see and Grandbat is willing to share stories of old as the game comes down to the wire. It is the rising sun that sends them scurrying home, to sleep and safety; always attuned to the next 'play ball'! The rhyming text offers up as many bat and baseball puns as you can imagine. Even the title will have readers smiling! There are bats at bat, a blind as a bat ump, the familiar bat-ball song in the seventh (Oh...hang me up in the rafters! Hang me up by the toes! Buy me some beenuts and Cricket Jack -), a significant win and a return to the home attic, caught ball in wing and big, satisfied smile on sleepy face. 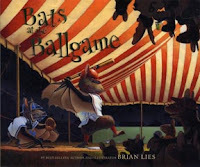 Brian Lies has a penchant for bats, it's clear; and for the Boston Red Sox, I think. If you know baseball, you will pick up on the red hats, the manual scoreboard, the Green Monster and even the 'pesky pole'. Each of his acrylic illustrations holds wonder for readers and listeners. The changing perspectives give a clear look at all of the elements of the game. From the bat's-eye view on the title page to the archival appearance of the bat fans on the dedication page, we know we have a treat in store. He does not disappoint. Each piece of art invites close observation and provides details that are heartwarming, often humorous and always a 'hit'. I laughed out loud at the doctored food banner, offering up garlic flies (not fries) and gnatwurst (not bratwurst). His use of light imbues each page with the secrecy and delight of night. The powdered sugar base lines, the forks used to smooth the infield, the rows of bats hanging upside-down from the tent ceiling, and the constant action will have new fans poring over every single illustration. It is a stunning book! "But in the east, the sky's aflame. We feel ejected from the game! we speed to beat the rising sun." I have saved this book for most of a year, because I wanted to share it at Thanksgiving. Thankful we are to have such authors and artists creating wonderful and worthwhile books for us. Now you know my secret....if Thanksgiving is on my radar, I must live in CANADA! I do, and we celebrate Thanksgiving one week from today...with turkey and all the trimmings that promise to make a feast for one small, brown, determined, hungry, frightened and lucky mouse! He begins with nothing on his plate. When Thanksgiving dinner is a thing of the past, Mouse leaves the security of his 'hidey-hole' for a quick peek. All is as it should be. Mom is catching a couple of winks in front of the TV, while Dad has fallen asleep reading his book. The kids are outside playing football in the crisp autumn air. Cat is basking in the warmth of the wood stove. Now, is Mouse's chance! The bounty is plentiful. A pea seems perfect. Back he heads to his humble home; but, he finds himself intrigued by the other leftovers on the table. Perhaps one cranberry, and one olive, and one carrot stick. As the pile grows higher, so does his dream of a delicious, delectable dinner. He is so intent on balancing the burgeoning, breathtaking bounty that he forgets to keep vigilant for his mortal enemy...the house cat. When he stops for some leftover turkey, readers might think his 'goose is cooked'. He comes face to face with CAT! The artwork is done in mixed media...acrylic paint, pastels and colored pencils. Each is used with a deft hand to create a world of wonder for all who share it. The changing perspectives add interest and draw the reader's eyes to the many details. Dad's hairy legs, red nose and button-popping belly give us a mouse-eye view of the aftermath of Thanksgiving dinner. The set table, complete with hand-shaped paper turkey place cards and Pilgrim salt and pepper shakers, is rife with yummy leftovers that will garner attention. The in-your- face close-up of Cat provides enough terror to have hearts thumping wildly. Add repetitive, expressive text and a quaint main character and you have a fine readaloud for sharing anytime, but especially now (or in seven and a half weeks from now). "Sophie was mentally probing her heart to see if it was broken. Nope. It was in one relieved piece. She felt on a tiny, minuscule bit sad she wasn't getting a gorilla. Her passion was gone. She might try living without it for a while. It felt so relaxing." If you have not met Sophie in her previous tales, Queen Sophie Hartley (Clarion, 2005) and Sophie Hartley on Strike (Clarion, 2006), you have a treat in store. In this third book about the feisty and free-spirited young girl, she is approaching ten, with all the passion that she has faced other grand times in her life. She lets it slip at school that she is going to get a baby gorilla for her birthday. Her friends are delighted; some are skeptical...Destiny, for sure. Destiny also manages to make Jenna wonder if Sophie is telling the truth. Caught up in her fantasy, Sophie agonizes over talking with her mother about the gift. Before they have a chance to deal with the whole truth, Sophie receives a letter from the zoo telling her that gorillas can no longer be bought, as they are endangered. It is suggested that she might want to adopt a gorilla...something for Sophie to consider. It is a time of change for Sophie. Her big sister Nora has decided that she needs a room of her own, for privacy. Sophie is left with a big empty room, few ideas and less incentive to make it her own. Nobody seems to be remembering that her birthday is an important one and coming SOON. One of her friends is more enamored of her lacrosse team and teammates than she is her 'true' best friends. A boy at school shares his interest in gorillas with her, causing some teasing and much anxiety for Sophie. Will the family remember her birthday? Of course, they will. And, her friends Alice and Jenna prove to be the 'best', indeed! Rife with humor, uncontrolled giggles, family drama, witty dialogue and authentic characters, this is a story that will enjoyed by many and is highly recommended. Check it out! "Everything had to be just so for Bear's bedtime. His glass of water had to sit on the exact right spot on his bed stand. His favorite pillow must be nicely fluffed. His nightcap needed to be snug. Most of all, it had to be quiet - very, very quiet." Bear is his old cantankerous self, and we know it from the first double-page spread. His pince-nez does not hide the fact that he is unimpressed and mightily disturbed by a bothersome tapping at his door. Fans of the two will know that Mouse is about to make an appearance! Tranquility is apparent in his surroundings...the furniture is lined up, the mantel is decorated and dust is absent from every surface. Bear is settled comfortably, cozily covered with his legs up and a book in hand. A disturbance is the least of his desires. ""My ears are highly sensitive," cried Bear." If you know Mouse, you know that is all the provocation he needs for what comes next. No matter how quietly he speaks, Bear can hear what he is saying and becomes more and more agitated. Contrite, Mouse eventually gets back to bed and quietly slumbers. It is too much for Bear...he is sure that he hears something in the house and needs Mouse to help settle his fears. Mouse does some concerted checking, finds nothing and agrees to tell a story to help Bear return to sleep. Perhaps, sharing the bed will not be so bad. Mouse, as is his wont, makes the best of it! 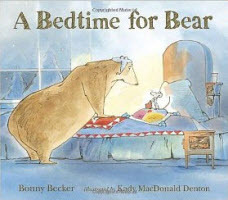 "Shhhhhhhhhhh....."
I am so glad that their continuing story returns to picture book format....full page spreads, bright watercolor artwork, the expressive characters that capture the humor inherent in Bonny Becker's story make it a remarkable read for parents and teachers. Kady's ability to reveal the feelings and give them human expression in these fast friends will have readers poring over the pages with a discriminating eye. It is a such a joy to share this book! ""No, you people have to sit in the upstairs section." Right then Viola understood crystal clear what she was saying. allowed to sit, stand or even be in the same section as white people." 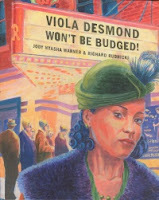 With a storyteller's voice and in plain speak, Viola Desmond's story is told to inform young readers today of her determination and courage when faced with the segregation of the times. When she takes a walk while her car is being repaired, she has no idea how the day will unfold. Knowing that the wait will be long, Viola decides she will see a show at the Roseland Theatre. She is told she bought a ticket for a different section and when she offers to pay more to sit in her chosen seat, the usher makes an issue of it. Viola refuses to move; first, the manager is called, then the police. Viola is taken to jail for 'not paying the proper ticket price'. A sentence of guilty and a fine of $20 is the result of her arrest. When she gets back home, she makes it clear to her friends and family what happened in New Glasgow and they convince her to appeal the fine. The Supreme Court does not want to talk about race issues and they determine that her case was tried fairly and she has no recourse. It is not what everyone was hoping would happen. But, her bravery made a difference and she could always be proud that she 'sat' for what truly mattered, at a time when black people had no rights. Her stand encouraged many others to speak out against racial prejudice and to fight for the rights of all people. The text is short and the story brief, but it moves quickly and packs a wallop...especially for those of us who did not know this story. It is not well-known, and needs to be. This book is a perfect start. The author includes a single page called a 'Glimpse of African Canadian History' and that might be all the inspiration needed to send readers looking for more. It is sure to open discussion about Canada and its racial history. Further stories from Viola's life can be found in a book written by her sister, Wanda Robson. It is called Sister to Courage (Breton Books, 2010) and offers many family stories that help to explain why Viola took a stand on that fateful day in 1946. From the torn ticket for the Roseland Theatre that admits one person for 30 cents (including 2 cents tax), to the honorable and proud woman pictured as the story ends, Richard Rudnicki provides us with a close-up look at the events of the time. The bright palette, the use of light, the historic setting and the small details that could almost go unnoticed give us an authentic feel for Viola and her act of bravery. She is fearful, angry, spirited, independent and forceful in standing up for herself and for others. We are privy to all that emotion through his spirited and dramatic artwork. "In my heart of hearts I've always wanted a sixteenth birthday party. Yet even though it falls on an apparently special day, winter solstice, I'm not holding my breath - no pun intended. Sunday, again. Six days after my pneumothorax, and the great day has at last arrived finding Signy, the rich city girl, and me, the poor country girl, sitting as usual on bedpans. TB, I'm beginning to discover, is an equal-opportunity kind of disease. The only requirement seems to be that you have lungs." Martha Brooks never lets me down! I eagerly anticipate each new book, and she does not disappoint. I finished one book last night and decided that I would just 'start' this new one. I began with a chapter or two in mind...not a good idea...as I was half-way through when I finally had to turn out the light. This morning, having nothing urgent to do, I picked it up again. Ah, the second half is now history! And I'm not sorry that I didn't get the laundry started, or the kitchen cupboard sorted, or even an early morning shower. I am instead, left to savor the story of a young, headstrong, healthy, opinionated girl whose life is stopped in its tracks when she contracts tuberculosis. We meet Marie-Claire Cote in the summer of 1940. She is the eldest child in the Cote family, with a younger brother and sister. Her Uncle Gerard arrives in need of a place to stay, and stay he does, until failing health and a tuberculosis diagnosis sends him to the Pembina Hills Sanitarium where he dies. Unfortunately for the three children in the family, they are soon battling this debilitating and threatening disease, each with a variation in symptoms. Luc, who has always been susceptible to illness cannot fight the dreaded disease and eventually dies. The family is devastated. Josee, the youngest, responds well to her treatment and is soon discharged. As we live with Marie-Claire through the prescribed treatment...complete bed rest, sleeping in the outdoors despite the freezing Manitoba temperatures, and few visitors...we come to understand the terrible toll tuberculosis took on those afflicted with it. She watches patients arrive and die, becomes aware that many have been there for long periods of time. She is angry, bored, sorrowful and anxious to find her way out of the prison that keeps her trapped, awaiting good health. Her friendship with Signy, her roommate is complicated. Signy is one year older, but has been ill for seven years. She counts on Marie-Claire to help her find solace and some sunshine in each day. It is a formidable challenge. For two years they struggle together through the process of healing. When a new roommate arrives, she brings a change for the two young women...she is a fiddler and that helps them make a connection with some of the young men who are recovering in another building. They are healing and closer to full recovery. Marie-Claire meets and falls for Jack Hawkins, who was her brother's roommate. A move from the infirmary to Creighton Cottage affords her some freedom, but she is drawn back to Signy in an attempt to help her continue her healing. 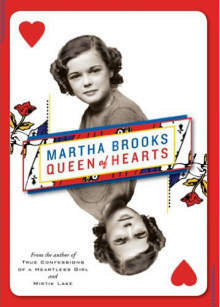 Martha Brooks is a writer whose characters resonate with readers for the long term. Marie-Claire is not easily forgetton and that is a grand compliment to the author's insight and research. She spent her early years living at the Manitoba Sanitorium in Ninette, Manitoba where her father was a doctor. That setting and her remembrances of her experiences there provided the inspiration for this remarkable story. It is hard to imagine that world, but she brings it vividly to life for her readers. She knows much and shares it all, with candor and no-holds-barred. Her story is a fictional account of a part of Manitoba's rich history. My husband's parents both spent time at the 'San' in Ninette. I wish I had asked more about life as they lived it then and how they were treated in the community as a result of contracting the dread disease. Isn't that what happens too often?